Rib roast is a traditional holiday meat. Convection ovens heat more evenly and cook food faster than conventional ovens, which works very well for large roasts. Convection ovens reduce cooking times and seal in the meat's juices to prevent it from becoming dry. However, when cooking an expensive piece of meat such as a rib roast, always test doneness by temperature, rather than by time. Rib roasts can be purchased two ways, standing or rolled. 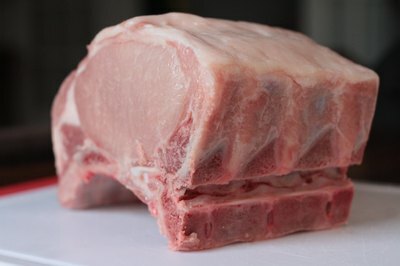 Standing means the bones are left on the roast and it can stand alone on a roasting pan. A rolled roast has had the bones removed and is normally cooked in a cooking net to hold it together tight. A full rib roast has seven ribs; the larger ribs located near the shoulder are also known as the chuck end, or large ribs. They run down the back to the loin, which is known as the loin, sirloin end or small ribs. There is less fat on the small ribs and the sirloin rib roast is slightly more tender. Each rib will serve two people, thus if you are having a dinner party for eight, you will need a four rib roast. The most common rib roast ordered is a roast with three ribs or a larger, small end, standing rib roast, which has the best flavor of the roasts. There are two types of convection ovens. One is called a true convection oven because it has a heating element in the back of the oven by the fan. This is to ensure that when the fan circulates the air, it is heated first. Other convection ovens use the fan to circulate the air that has been heated by either the top, bottom or both elements. Although this is still a more even and faster way to cook than a conventional oven, it does not produce the even temperatures of a true convection oven. If you have a true convection oven, the roast can be placed anywhere in the oven for even cooking. However, if your oven does not have a third element, use the bottom position in the oven and choose the convection roast option. 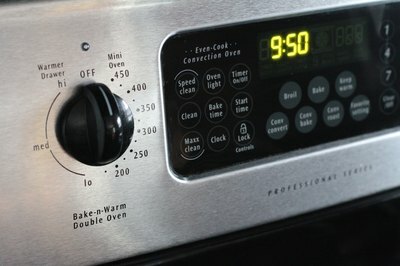 Knowing the cut of roast and type of convection oven you have will help you to determine the time it will take to cook. If you were to read ten different recipes, the cooking times would all probably be slightly different. There are a few reasons for this, but suffice it to say that no two roasts or ovens are alike. Some roasts have more dense meat and less fat, and will take more time to cook; some ovens are older and need to be calibrated. Never use time alone to cook your roast. 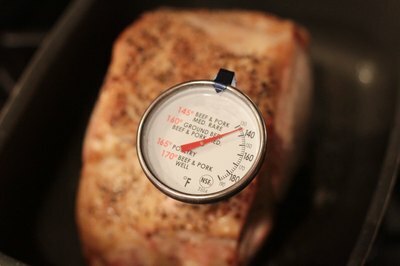 A temperature probe that's left in the meat while it's cooking is the best way to determine temperature, followed by a quality meat thermometer. Start with a room-temperature rib roast. Allowing the roast to sit on the counter for at least two hours before cooking will ensure the most even cooking. Season your roast to your liking and place it in a roasting pan on a rack so the roast is not in direct contact with the pan. Preheat the oven to 450 degrees F and place the roast in the oven, cooking it at that temperature for 15 to 20 minutes in order to sear it--20 minutes for the larger roasts. Turn the temperature down to 200 degrees F and cook for about 25 to 30 minutes per pound. Slow-cooking will give you an absolutely wonderful roast. Baste the ends of the roast at least every half hour and check the temperature. Once the temperature reaches 110 degrees F for rare meat, or 120 degrees F for medium, take the roast out of the oven and set in on the counter tented by aluminum foil for about 15 minutes. The internal temperature will continue to rise--more so with convection cooking than a conventional oven. Check the internal temperature again after 15 minutes to be sure the roast is done the way you want it. Rare to medium-rare is 120 to 135 degrees F. Medium to medium-well is between 140 and 155 degrees, and well done is 160 degrees F. However, if the internal temperature is 160 degrees F, the end pieces will be overcooked and will not taste very good. Some restaurants will not even cook a rib roast past 140 degrees F.
While the roast is sitting, turn your oven off and leave the door open. Then return the roast to the oven after the sitting time and close the door until you are ready to carve it for dinner. The roast will stay hot for an hour or so while you make your au jus or horseradish sauce and other accompaniments.